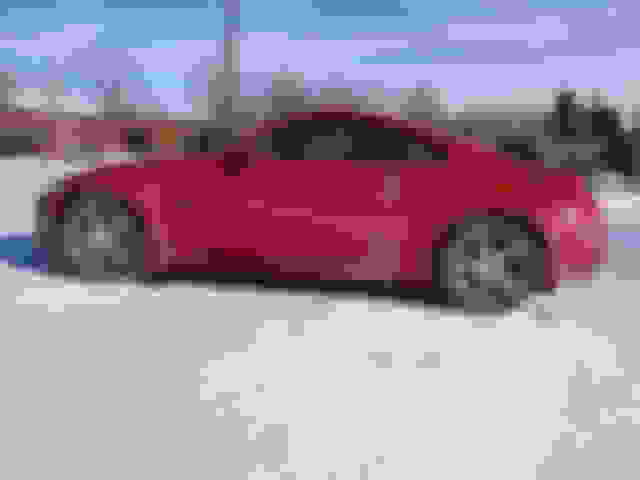 I'm considering a 350 convertible to replace an Audi TT that my son totaled. It would be my daily driver. How good are these cars in snow and rain? ^ This and this. I remember the early days on this forum where we'd have at least 2-3 spinouts and crashes per month due to rain and sh*tty tires. Welcome- the 350Z is a powerful RWD sportscar with a near 50/50 weight distribution. Depending on what type and condition of tires are mounted, it can be OK in the rain. But heavy snow means you'll need snow tires to even attempt making it a DD. It's absolutely fine with the correct tyres for the weather conditions of course. Snow, well we don't really get much over here, so I leave Michelin Pilot Supersports, or Pilot Sport 4 on all year round. The only thing I would suggest, is to ensure bushings and alignment is all in good order. A friends Z many years ago handled badly due to tyres, bushings and poor alignment. Last edited by RobPhoboS; 01-28-2019 at 02:22 AM. The same as any RWD car. . . Terrible in snow and rain with the factory Potenza tires... better with Michelin Pilots. 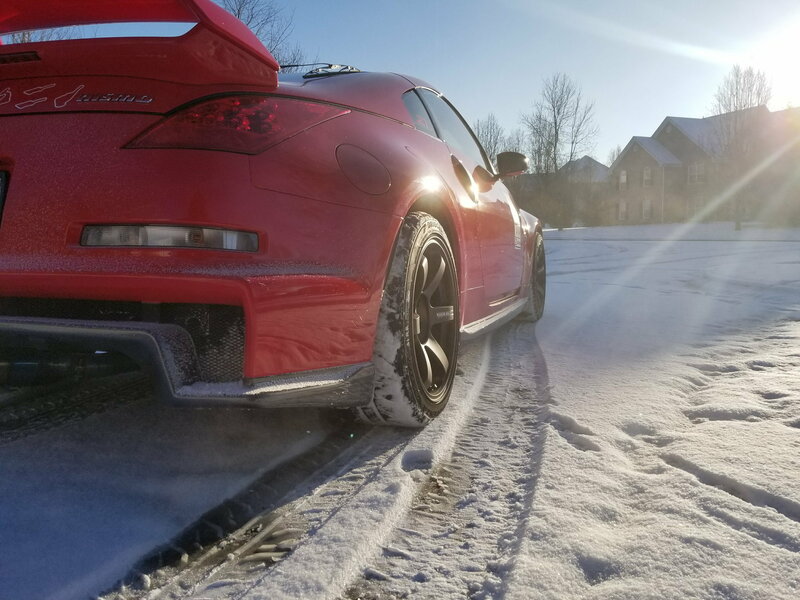 I live in PA, and don't consider driving mine in the snow (its not my daily driver). Most guys who run 350Zs in crummy weather have some sort of sport grade profile winter tires...like Blizzaks. Rain has been fine for me. 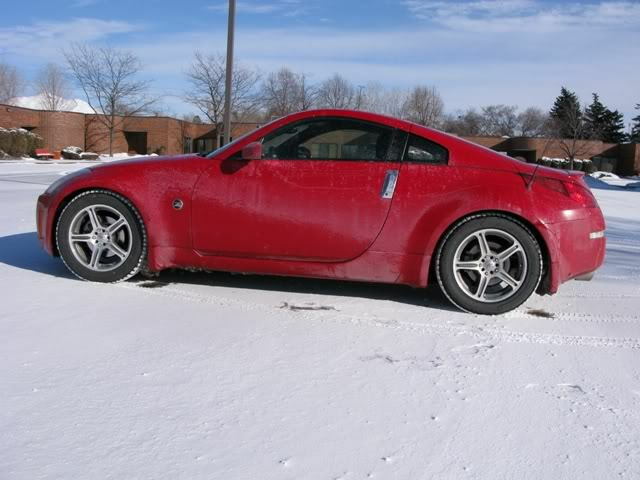 Driving in the Z in the snow on all weather tires is the most terrifying driving experience I've ever had. Even with the most delicate brake feathering the car slid and rear end whipped out when coming to a stop. Immediately bought another set of wheels and winter tires... but it hasn't snowed or iced in Texas in quite a long time so I haven't tested. Have enjoyed driving it in the snow and rain! Last edited by Lumpia_Boy; 03-10-2019 at 07:08 AM. I drive my 350z on ice and in snow, and I can honestly say I have no trouble doing this. I drove around yesterday when we were getting an inch plus per hour of snow.The winter weather in Minnesota absolutely requires studless snow tires. I have a dedicated wheel/tire setup for winter. Quick Reply: Snow and rain?